Setting up your web hosting server entails a lot of things. Aside from making sure that it is working, it is a must for the user to ensure that the server or the network of computers serving as your primary server is protected from online and digital attacks. Without proper protection, your network can be vulnerable to such attacks and an attacker can easily override your system and manipulate your network, which can lead to more serious problems such as hijacking of connection, website and web server traffic problems. Before fully operating your system, it is a must that you set up a couple of hosting protection and set up a proper protocol like Secure Shell (SSH) to guarantee the safety of your networks. SSH, or Secure Shell, is a secure network protocol that connects and network users using a high level remote system. This software encrypts the data that is being sent between computers, networks, and users through a symmetric cipher. Once the users validate and authenticates the encrypted key, users can now communicate and interact safely with their remote servers using their encrypted connection. SSH protocols promote integrity of communication among servers, users, and networks and provide a safe tunneling and forwarding of validation or encrypted keys between the parties. SSH authenticates users using two pair of keys: the private key and the public key encryption. Both keys are essential on SSH protocols and the two of them have different uses to validate the users and the other parties involve, but both are inclined mathematically. This is also known as the Asymmetric cryptography. To be able to validate and authenticate the user, he must have two sets of sub keys which also described as the public key and the private key. The public key is the one that encrypts the data that is being sent. If you are going to use this method, you should obtain the other user’s public key to encrypt the data or the cipher text and send it to the other user. The other user would decrypt the message using the private key. This protocol uses a single key. Both parties should have access to the private key setting to be able to continue with this procedure. Using the private key, you will encrypt the message and send the cipher text to the other user and he will use the same key to decipher the encrypted data. What are the advantages of using SSH? Are there security limitations in SSH protocols? Yes, there are limitations and security features that SSH protocols cannot provide. For one, it can’t verify an unknown public key that is why it is important to verify them before accepting them as valid. Also, it cannot protect your network from incorrect configuration and compromised root account. And if the unauthorized user has access to your home directories via NFS, he can manipulate and override the SSH, so it is a must that these things should be set. What security benefits does the InMotion SSH provide to its clients? Despite the limitations, InMotion SSH can provide you with a lot of security features to guarantee the safety of your networks and servers. 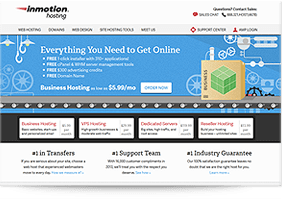 If you have a VPS hosting and Dedicated Hosting in InMotion. They will provide you the necessary SSH access. Aside from the benefits mentioned above, you can have User and Host authentication, as well as, proper data encryption to secure your public and private keys. Does InMotion Offer A Website Builder? Is InMotion Compatible with Mac? How Much Do Extra Domains Cost On InMotion? Does InMotion Offer Monthly Payment? Can I Pay InMotion With Paypal? Can I Pay InMotion With Debit Card? Can I Build a Good Site With InMotion? Does InMotion Offer SEO Services? Does InMotion Offer Website Templates? Does InMotion Work On iPhone and iPad? Can I Cancel InMotion Anytime? Can I Transfer My Site Away from InMotion? Can I Transfer My Site to InMotion? Does InMotion Let You Own Your Site? Does InMotion Put Ads On My Site? Can I Start A Blog on InMotion? Is InMotion Hosting A Green Company? Does InMotion Offer Website Backup? Does InMotion Offer A Dedicated IP Address?